Step 1. Cut a shape to form a Christmas bauble from felt. Step 2. 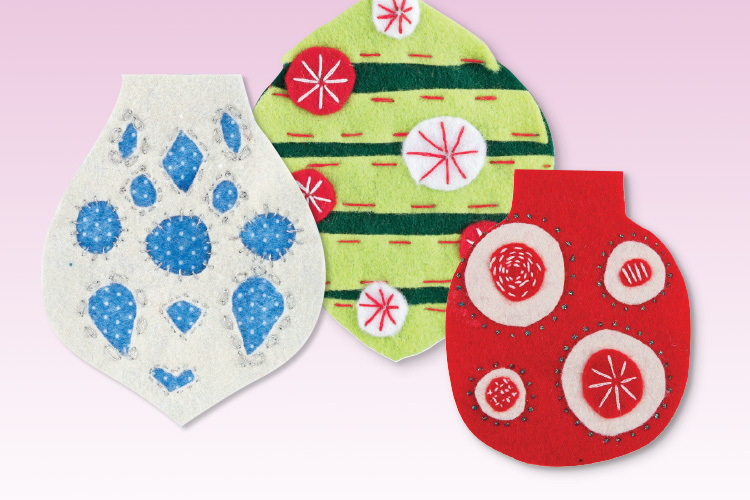 Cut smaller circles from contrasting felt colours to decorate the bauble. Step 3. Use decorative stitches to attach the contrasting colours in place. Step 4. Decorate the background with Kindyglitz. Step 1. Cut out a bauble shape from printed felt. Step 2. Cut out the same shape from Christmas felt. Step 3. Working on the Christmas felt, cut out smaller shapes. Step 4. Lay the Christmas felt with the cut-outs on top of the printed felt. Step 5. Stitch around the cut shapes to secure the two pieces together.